What to do with the kids during the winter half term can be a challenge. We all know the weather can be unpredictable, at best, so the February school half term at home can feel like a lot of time locked in at home with children with far too much unused energy… does that sound familiar? 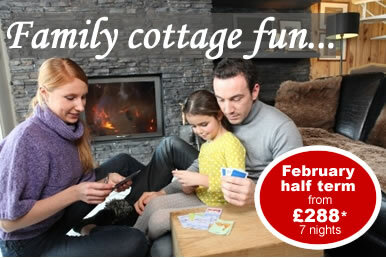 If it does, then why not consider taking a short break in a holiday lodge this February half term? It really is a perfect family solution. Lots of lodges can be found on popular holiday parks across the UK. During the School half term many of these parks will run kids entertainment programmes for everything from exploring in the great outdoors to indoor art and creativity sessions. In fact there will be lots to keep children of all ages entertained so that Mum and Dad can enjoy the break to, whatever the weather. Many of the holiday parks with lodges also have swimming pools, table tennis tables, amusements and other facilities such as indoor play areas. So there are lots of things to do to wear even the most active children out during a fun packed day. Lodge accommodation is perfect for families providing comfortable and affordable self catering. Cosy even in February, lodges are available for families of all sizes and that includes your pet dog too!